Today, Blacktip decided to join the crusade to kill Adobe Flash Player. As an IT services / Managed Services Provider specializing on the Apple platform, we remember the sage words of Steve Jobs in his open letter extolling the justifications to prevent Adobe’s product on the iPhone. Internet communities are getting serious about spreading the word – Occupy Flash! Bluntly – We agree and believe that Adobe’s Flash should be removed from the web. Period. Blacktip goes to great lengths to ensure each client’s networks are secure and that their technology is optimized. We spend time per day searching the internet and we want to do it as quickly and as securely as possible. If you are aren’t on top of your business computer security, yet, a hacker will surely make you a believer. Read up on ransomware attacks that will take your system down for a few days. The mass distribution of of this Player makes it an easy target for hackers. “The Flash Player is a very interesting target for attackers because it really is ubiquitous and runs in all major browsers,” says Jérôme Segura, senior security researcher at Malwarebytes. “On top of zero-days, many end users are still running older versions which explains why the number one piece of software exploit kit writers go after is Flash,” (Wired Magazine). Attackers scare users into “updating” their Flash Player only to then deliver malicious downloads. All the security software and hardware in the world can’t beat out uninformed users. Ok, so Flash is insecure, we get it. Flash is also a resource hog sucking battery power and CPU performance from your computer. 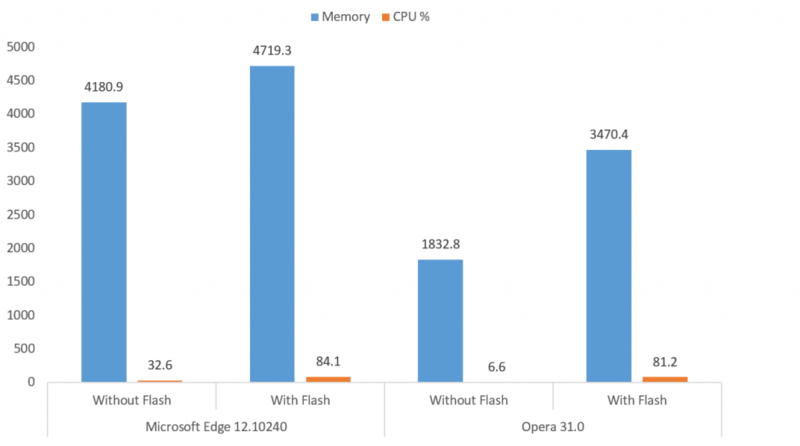 In August of 2015, PC World conducted a thorough test of Flash with plugins installed on Chrome 44, Windows 10’s Edge Browser, Firefox 39, Internet Explorer 11 and Opera 31. As you can see from the chart, PC World found that the product placed a 61% load on CPU consumption using Microsoft Edge, using Opera, it required 81% of CPU, and Chrome consumed 71.4% of CPU. Yikes! Chrome now contains a feature that halts “content not central to the webpage” preserving CPU, but giving the user the ability to play the Flash video if desired. Microsoft’s Windows 10 will include a similar feature when an update is released this summer. Neither of these features won’t affect video content that is part of a web site. Join Blacktip in the crusade to wish Adobe’s poorly coded Player a fond farewell, secure your environment and make your computer faster. Go ahead, do the right thing and either uninstall or disable the Player on your computer. Adobe provides instructions on how to remove it here. Click Plug In Settings to the right of Internet Plugins. Click the menu button, followed by Add-ons. Click the Plugins panel and select Options next to Shockwave Flash. Remove the checkmark next to Enable Adobe Flash protected mode. Click the Internet Explorer icon on the Taskbar or in your Start Menu. Under Show, tap or click All add-ons, and then select the add-on you want to turn off. Tap or click Disable, and then tap or click Close.